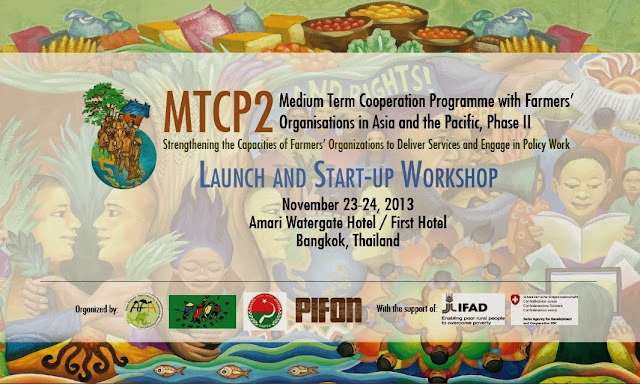 Farmers’ federations from Asia-Pacific, with support of the International Fund for Agricultural Development (IFAD), will organize the “MTCP2 Launch and Start-Up Workshop” on Nov 23-24, 2013 in Bangkok, Thailand. The MTCP2 Launch will be held at Amari Watergate Hotel in the morning of Nov 23 while the Start-Up Workshop will be held at First Hotel in the afternoon of Nov 23 and the whole day of Nov 24. The consortium of the Asian Farmers’ Association for Sustainable Rural Development (AFA) and La Via Campesina (LVC), together with the All Nepal Peasant Federation (ANPFa) and the Pacific Island Farmers Organizations Network (PIFON), mobilized various farmers organization in 15 countries from the Asia-Pacific region, civil society organizations, governments, donor agencies and research institutions to identify areas of complementation/cooperation towards creating greater impact in unleashing the potentials of small-scale farmers to respond to poverty reduction, food security and nutrition. The start-up workshop hopes to provide opportunity for key implementers to prepare for the effective and efficient implementation of the MTCP2 project in 15 countries in the Asia-Pacific region. MTCP2 or the “Medium Term Cooperation Programme with Farmer Organizations in Asia and the Pacific,” a capacity building program funded by IFAD, aims to strengthen the capacities of farmers organizations in Asia and the Pacific to deliver better, improved and inclusive services to their members and to engage in effective dialogues with governments, thereby making FOs more viable, responsive and accountable to their members, more respected by their partners and with greater participation in policy-making and program implementation processes of governments and IFAD country operations. Its primary beneficiaries are smallholder farmers who are current or potential members of participating FOs. Its main participants are 150 FOs representing 20 million small-scale farming families in 25 countries in Southeast and South Asia and the Pacific. In response to the growing clamor of FOs worldwide through the Farmers Forum processes of IFAD, and to the strong recognition of the role that small-scale women and men farmers play in poverty reduction, food security and nutrition, the first phase of the Medium Term Cooperation Program for Farmers Organizations in Asia and Pacific (MTCP1) was implemented from 2009-2012. The MTCP1 succeeded in bringing together different national and local FOs in 10 countries in Southeast and South Asia in regular dialogues among each other, well as with their governments and FAO and IFAD representatives, resulting to increased opportunities for partnership and involvement in policy making and country program processes as well as increased venues for farmer-to-farmer sharing of experiences and initiatives. MTCP2 hopes to strengthen the gains of MTCP1, expand the program further to other countries, and thus, make FOs effective channels for real transformation in agriculture – one that truly benefits small-scale women and men farmers, fishers, indigenous peoples, and pastoralists/herders. The launch of this project will be graced by representatives from AFA, La Via Campesina, ANPFa, PIFON, IFAD, FAO, SDC, AsiaDHRRA, and other farmer, government, and civil society organizations. Journalists are invited to cover the official launching ceremony at 9:00 AM. Interested but unable to attend? Join us online!